We are proud to be serving Georgetown, KY as your local gutter contractor. When it comes to protecting your home from water damage, you can trust in our quality workmanship. Our guttering services include installations and repairs for gutters, downspouts, leaf guards and drainage systems. We install our gutters onsite for exact match specifications. Your water protection system will be perfectly fitted to ensure no moisture penetrates your home. 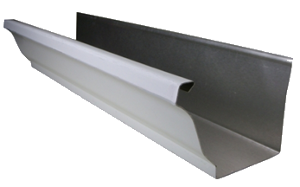 Choosing to go with aluminum seamless gutters is a great choice. They give you the option to match almost any color and painting them is an option if they don’t. You also notice that they don’t rust, which is a huge benefit when it comes to the appearance of your home. Sometimes gutters can be damaged by mother nature. Storms can cause a variety of damages including hail and high winds that knock over trees. Our gutter repair services in Georgetown will have you back to shape in no time. If you feel you may have damage caused by storms, make sure to check out our insurance replacement services for gutters. Looking for an affordable face lift for your home? If you’re wanting to change the look, color or style of your gutters we can help! When it comes to durability and maximum performance we always recommend going to a 6 inch guttering system. It allows your drains to channel the water more efficiently while prevent blockage that normally occurs in smaller 5 inch gutters. We love being recognized with quality service. We also understand that there are many great gutter companies in Georgetown. Our commitment is to deliver an experience that our clients want to rave about.